If you've been a horror fan for as long as I have, then I'm sure you might consider the early '90s as being the worst of times. Not a whole lot of very good horror movies were released in the years prior to Scream coming along and shaking up the genre. But while there were a handful of modern classics like Candyman, Army of Darkness, and Wes Craven's New Nightmare released during the first half of the decade, they were far outnumbered by schlock like Leprechaun, Ghost in the Machine, Carnosaur, and Texas Chainsaw Massacre: The Next Generation. Another of these disappointing movies was a little-known flick titled Brainscan. Starring a post-T2 Edward Furlong and scripted by a pre-Seven Andrew Kevin Walker, Brainscan tells the tale of a troubled teen whose escape into an odd computer game leads him down a very dark path. That probably makes the movie sound more interesting than it really is, to be truthful. So let's get to it. All outward appearances would suggest that sixteen-year-old Michael Brower (Edward Furlong) could be living a pretty sweet life. He lives in a huge house in a nice town, and has converted the entire attic into a veritable geek palace, with all the comic books and awesome high-end electronics that money can buy. And with his father gone on business most of the time, he's left to do damn near whatever he pleases with no parental supervision. He's even the founder of his high school's "Horror Club," a small group of students that meet to watch and discuss violent horror movies despite the disdain that the surly school principal (David Hemblen) has for their activities. Unfortunately, the physical and emotional scarring left behind after the car crash that killed his mother years before has put Michael in something of a prolonged funk. His main social activity outside of the Horror Club is hanging out with his flippant best friend Kyle (Jamie Marsh), and though he pines for the affection of his pretty neighbor Kimberly (Amy Hargreaves), he's too shy and withdrawn to say anything to her about it. So what's he do? He puts a camcorder in the window and peeps into her bedroom on a nightly basis. So he's like George McFly if he listened to heavy metal and had a really negative attitude. But enough setup, let's get to the meat and potatoes of things. The ball gets rolling when Kyle shows Michael an advertisement in Fangoria for a new computer game called Brainscan. Billing the game as "the ultimate experience in interactive terror" and "the most frightening experience available on this planet," the advertisement also promises that Brainscan will "satisfy your sickest fantasies" and "unleash the dark side of your soul," but warns that it's not for the squeamish. His interest piqued, he calls up the number on the advertisement, and orders up a copy of the game. Using a flashing light sequence to lull its players into a hypnotic trance and with a disembodied voice urging him on, the game gives Michael an hour to enter a house, stab a sleeping man to death, and chop off his foot as a trophy. Michael accomplishes this with time to spare, but he discovers the next day that a local man has been killed in the exact same fashion as how he did it in the game. Add in the severed foot he discovers in the refrigerator, and things just aren't going Michael's way at all. And things are about to get much, much worse. The game's master of ceremonies, a grotesque figure calling himself "the Trickster" (T. Ryder Smith), emerges from the game, congratulating Michael on what he did and urging him to play the game's three remaining chapters. But in spite of Michael's increasing protests against continuing, Trickster pushes him to cover up evidence and eliminate any potential witnesses, even if those witnesses are those people closest to him. And as the pressure from both Trickster and a curious police detective (Frank Langella) mount, Michael's sanity is pushed dangerously close to the breaking point. 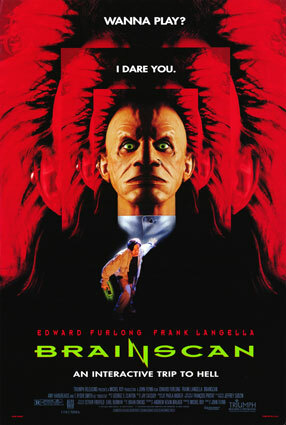 One could make the argument that Brainscan may be ahead of its time, as the plot could be construed as a metaphor for the theory that violence in video games can lead to violence in real life. That probably wasn't the movie's intent at the time, and thus that angle doesn't seem as touched upon as it could have been. If Brainscan had been made about ten years later, after the Grand Theft Auto franchise's rise in popularity, then maybe. But even if the movie did utilize that angle, it still wouldn't save it from being a thoroughly mediocre waste of time. And that's the really tragic thing. While it boasts an intriguing premise, the movie isn't very good. It's not a bad movie either... it's just kinda there. If it fell on either the good end or the bad end of the cinematic spectrum, then I wouldn't have to struggle to think of things to say about it. But no, Brainscan just had to go and only be of "meh" quality. And movies like that really grind my gears. But I guess I'll need to break this down anyway, though I'll probably end up repeating myself a few times. The direction by John Flynn, best known for directing Steven Seagal's Out For Justice, is pretty good. It isn't anything groundbreaking, but he does keep the movie at a relatively brisk pace while getting some good cinematography from François Protat. There's also some fantastic original music composed by George S. Clinton. Clinton's music for Brainscan sounds like something Angelo Badalamenti would have done for Twin Peaks, with a trippy, surreal sound that is used to good effect. The rest of the soundtrack is give or take, however. The tracks contributed by Primus and White Zombie are pretty good, but the rest, from various bands that I've never heard of before, seem like generic filler. The rest of the move, meanwhile, is a mixed bag if there ever was one. While Andrew Kevin Walker may have written Seven and Sleepy Hollow, he's got a few less-than-stellar entries on his résumé, and this is one of them. As I've said, the movie's concept  a teenager's actions in a video game having violent repercussions in the real world  is an intriguing one, but it could have been done a lot better. Maybe there was some script doctoring going on by someone who didn't know what they were doing? I mean, did the movie really need that lame running gag with the German shepherd showing up everywhere? I can't even find much of anything to directly point at and say, "That's what went wrong with the script." But I did notice a general sense of poor storytelling, along with a big number of clichés. There's the loner with the goofball best friend, the girl next door that the lead character has the hots for, the suspicious cop, and the one adult that treats everybody like crap because of his crummy disposition. And then there's the Trickster, who just seems like a lame attempt to create a new Freddy Krueger. He's got an intriguing look, has a wisecrack for every situation, and even the ending feels like a setup for a potential Brainscan 2. If more time had been spent crafting Trickster as a true threat rather than as Freddy Jr., maybe he would have been a bit more memorable. Last on the list is the cast. Edward Furlong's career may have started with a bang in Terminator 2, but then he did Pet Sematary 2 and started sliding into obscurity. That slide continued that slide with Brainscan, and while I can't say that he's bad per se, he's too inconsistent to make any lasting impression. He's either brooding, mildly upset, or absolutely out of his mind. Furlong doesn't make a smooth transition between these emotions, just jumping to whichever one he needs from scene to scene. Maybe that's why he's only done two or three memorable movies in his career? Meanwhile, Jamie Marsh is likeable in the handful of scenes he has, despite his clichéd character. I also liked Amy Hargreaves, though I didn't feel there was a whole lot being demanded of her besides being cute. There isn't a whole lot asked of Frank Langella either, and he must have known that because he seems like he's just reading his lines off cue cards. He must have impressed somebody, though, because he played pretty much the exact same character in Bride of Chucky. Let's not forget the last member of the cast, T. Ryder Smith as the Trickster. As I stated above, Trickster struck me as being a Freddy Krueger wannabe, and Smith plays Trickster as such, only with more punk rock sensibilities. His performance is over the top, as he recites his dialogue with a smirking cockiness that makes him entertaining in spite of his character's deficiencies. I'd definitely go out on a limb and call Smith's performance the true highlight of the movie, something to make it worth seeing. So yeah, that's my take on Brainscan. It's a relatively obscure movie by most standards, and for understandable reasons. The only thing that makes it memorable at all is the idea of unknowingly committing real murders through a computer game. Take that away, and all you're left with is a mediocre, utterly forgettable movie. And that pretty much sums the whole thing up. It's definitely watchable, entertaining at times, but it's nothing that you should feel guilty for missing. I guess I'll give Brainscan two stars. There was the potential to make a great movie here, but it just seems wasted.